I'd really love some crit on these. Still making more tiles, but if there are any problems so far or any room for improvement, I'd like to hear it. Interior tilesets are not my strength, so I'm really trying to push myself here. Re: Making some RPG tiles. Yo, this is pretty cool, I've seen some of your tiles for this game on pixeljoint, seems to be coming along fairly well. You have a good handle on the textures and colors, which are very well done. A little rough around the edges on some of the shading though, specifically some right angles on some of the colors on the wall. And the diagonal wall rendering looks a bit rough. But what really is the next step here, besides making more tiles, is developing its visual function in the game and developing it into a hierarchy. What is this place? It seems to be some kind of factory but some context would be nice. 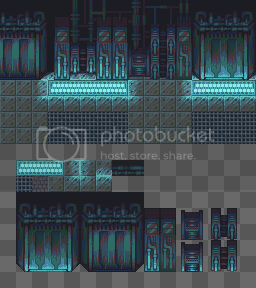 The lights, which is a cool effect having them on the floor and illuminate the objects around them, could ultimately detract from the sprite level, and bring attention to something that is essentially a background detail. Use lighting/luminosity to control the player's eye to important actions on the screen. Atmospherically it looks great, but maybe some sprites in context will help the analysis of juxtaposition. Ideally the sprites are the brightest layer, so they can be seen, and because they are important because of their actions, whereas the tilesets serve as a backdrop and creates the space for them to act within. Just some thoughts, very curious to see some more work from this game. I would darken the wall and lighten the floor. To me it just looks a little flat like the wall and floor are on the same plane. 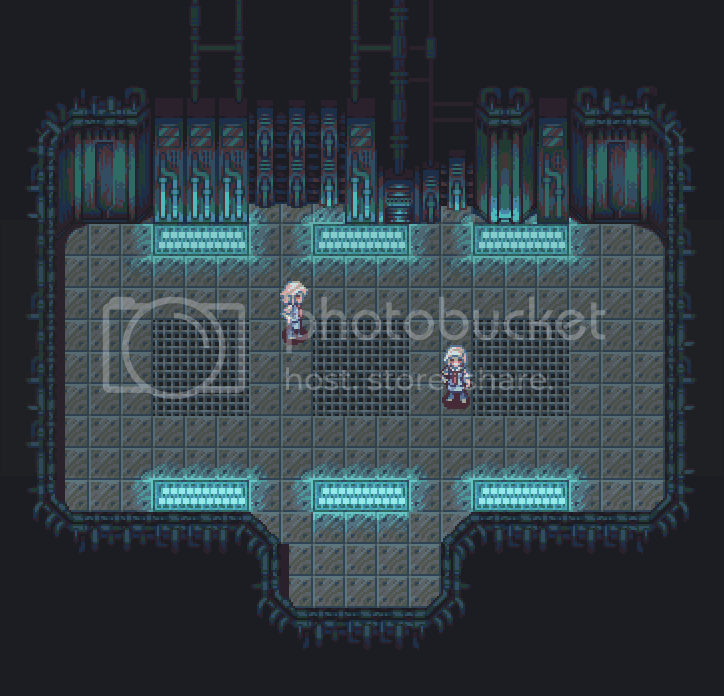 Added some sprites and lightened the floor and cleaned up the walls a bit (are they better now?). I usually develop tiles with sprites next to them for comparison, but I didn't this time because I guess I got sidetracked fixing up my old tiles and hadn't gotten around to doing a palette swap on the sprites yet. 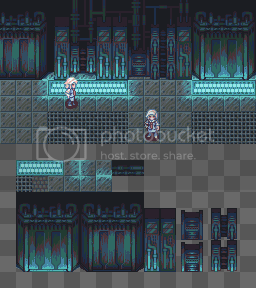 Since this area has such extreme lighting, I'm using a different palette for the sprites. Yeah, the floor lights might be too bright for floor tiles. Maybe smaller lights? I don't really need two rows of them. This place is a high-tech compound with lots of esoteric stuff around. There are people in tanks and lots of complex systems supporting them, ergo the pipes everywhere. And also lots of really sophisticated computer hardware. Actually I think if you darkened them it would be harder to read and rather confusing. Unless yo--RetroRob means, very very slightly. Perspective seems a bit wonky. Floor is seen as if from a bird's-eye view, the sprites and wall are seen otherwise. I'd just decrease the vertical-to-horizontal ratio so the floor tiles are more like rectangles, not squares. Unfortunately, square tiles are a limitation of the engine. I see what you mean, though. I may experiment with half tiles, but it's not something I'm too concerned about. I appreciate the feedback, though! In the meantime, I did a few more tiles. Loving those roof tiles! Hmm, maybe you could do some fake transparency on that wall shadow? Recreating the floor tile with darker colors similiar to how you did the light effect on them. I would say, take the floor lights down by 1 notch on your blue palette, so the lightest blue now becomes the second lightest blue only across all colors. The sprite is pretty bright, but he almost looks like a ghost. Need to get some color back in there. As for the perspective you basically have 2 choices, dark floors, lighter walls, or vice versa. It can work either way as long as you control the layers of importance so the player isn't visually distracted. Right now if you try to focus on the sprite, your eye wants to jump to the floor lights because it has more color and is brighter. Let's see those people in tanks, and maybe some HR Giger inspired tiles. Maybe some wires curling around the floor too. I think it looks cool just gotta say there is no need to post images that are double pixel because we can just click/shift click the image to zoom in/out. I think you'd get a better result if you zapped some of the saturation out of the lights instead. And yeah, darkening the floors hurts the readability of the wall, but there is something off in the wall/floor relationship that's causing that reaction. If you made it slightly darker, it might help. -more pipe definition to the right and forward facing roof. -added grey (from floor tile) to transition the lightest green on the main wall. The way the light reflections in the floor has some single pixel noise in it doesn't feel nice for light. Light looks weird when it looks fuzzy. Try to make the reflections on the floor feel either sharper or smoother, and less fuzzy.